Here’s FTF’s guide to the best family and kid activities in Tampa Bay, a central Florida city that’s not as well known as Orlando (about 45 minutes away), but packs in a lot of family attractions. Tampa is one of the largest metropolitan areas in all of Florida. It offers visitors zoos, aquariums, and some truly one-of-a-kind amusement parks. Short stay visitors or families playing in town while kids participate in one of the amazing week-long camps (see below) should purchase a Tampa Bay CityPASS ticket booklet. You will save 39% off admission to Busch Gardens Tampa, The Florida Aquarium, Tampa’s Lowry Park Zoo, the Clearwater Marine Aquarium, and the pass holder’s choice between the Chihuly Collection presented by the Morean Arts Center (best for art lovers and really young children) or the Museum of Science and Industry (MOSI is great fun with schoolage kids). Best yet, their passes give you first in line privileges, and their site is a very informative resource while you’re in town. Keep in mind that during summer, there’s daily rain showers and if they bring lightning, many outdoor attractions will close. For more information about what these institutions offer the camp-goer or the casual visitor, read on. With over 170 fun and challenging ‘interactivities’ in 12 themed areas, there’s so much to explore, discover and do for babies through ages 7 or 8. We especially like their extensive water play area modeled on the Port of Tampa, where kids can “pilot” a cruise ship (and lose their license for poor driving); create weather havoc for small ships by manipulating wind and wave machines; and just get their hands wet. There’s a grocery store, farm, upstairs recreation zone and much more fun, plus a summer 2014 exhibit entitled “Roadside Attractions.” The Glazer has three programs daily just for toddlers, separate play areas for them, and a Subway sandwich shop for lunch. Tampa’s main zoo, located in downtown Lowry Park, is renowned for its community programs that allow local kids to visit the Animal ER and learn about veterinary science, as well as get to know the many animal species that flourish in this tropical climate. This large, non-profit zoo includes a Florida Manatee and Aquatic Center (manatee rescue is a large part of the fascinating Animal ER facilities), as well as a native Florida Exhibit, Primate World, Asian Domain, aviary and a petting zoo. If you don’t have a chance to swim with the manatees in nearby Crystal River, be sure to drop in. Families may also be interested in the Zoo’s behind-the-scenes Premium Experiences with a tour guide, or summertime day programs taught by school teachers. Here’s a parkful of over 150 life-size dinosaurs that stand perfectly still, but no worries, a recent 12-acre expansion has brought animatronic dinos here, too. Like its sister park in Kentucky, Dinosaur World Florida allows visitors an experience not unlike walking through a prehistoric picture book. There’s also a “fossil dig” activity that lets kids find and take home their own small fossils. The pathways are paved and though there are no food facilities, picnicking is allowed. MOSI is the largest science center in the Southeastern US, with a big planetarium and its own zip line and ropes course outside. Focused on bringing a love of science to tweens and teens, the museum takes advantage of more than 450 hands-on exhibits to provide hours of “edutainment.” Kids can get engaged in science by pedaling a bike across a cable high up in the air, or laying on a bed of nails. A fun rainy day getaway with school-age children. This animal rescue park has been in operation since 1992 and has launched into an educational mission to provide rehabilitation to more than 100 “lions, tigers, bobcats, cougars, servals and other species — most of whom have been abandoned, abused, orphaned, saved from being turned into fur coats, or retired from performing acts,” according to their website. BCR has two-hour-guided tours of their fantastic collection of large and exotic cats. There are even Feeding Tours on which visitors can help feed the animals. Cabins are also available for overnight rental, to experience the nightly howling of the residents. Due to the “up close and personal” nature of these safari tours, children under 10 are not permitted on the regular tours, though there are 9am kids tours on weekends. This sightseeing company takes you on a panoramic view of Tampa’s bays, backyards, birdlife and beaches. A three-and-a-half hot air balloon flight, available only to kids 5 years and older (kids rates for ages 5-10); it’s an unforgettable experience. Note that a minimum height of 48″ (to see over the sides of the basket) is required of all. Explore Northern Hillsborough and Southern Pasco Counties from above and if you’re lucky, you’ll be able to count alligators among your finds. Electric vehicles from eBoats Tampa are based at the marina next to the convention center, and it’s a fun way to explore the Hillsborough River and motor quietly past the onion domes of the historic Plant Hotel, now part of the University of Tampa. The tourist office can connect you with mini-speedboats that seat a family of three; stand-up paddleboard rentals, loaner bikes from CityBike Tampa, a rental Harley-Davidson or even a Segway. This popular attraction has many distinct themed areas that bring a little of Africa to the Tampa area. Almost more impressive than the pretty, heavily shaded and landscaped amusement park, is the fascinating collection of more than 12,000 animals. An Animal Care Center welcomes visitors to watch the in-house vet staff do animal wellness exams and even surgery, while exhibits there and throughout the park allow all ages to learn more about African animals and their habitats. Of course, the park is best known for 335 acres of family entertainment including the Gwazi “dueling” wooden roller coasters and Falcon’s Fury, a terrifying looking tower with a 300-foot-plus freefall. Grandparents and parents with toddlers will find smoother rides, waterplay coasters, a Sesame Street Safari of Fun play area, as a well as a fun carousel in the North African/Arab “Pantopia” section. Teens will love the VR and motion control rides, and other thrilling coasters. 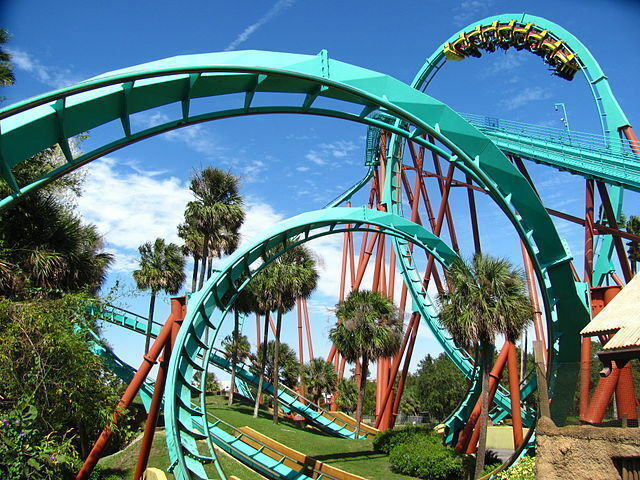 Busch Gardens definitely warrants a two-day visit so you can take little ones on a stream train or bigger kids on a behind-the-scenes Safari Encounter with giraffes and ostrich. Adventure Island has 30 acres provide water-soaked excitement for guests of all ages, making it a great combo with sister Busch Gardens Tampa on hot, sultry summer days. From mid-June to mid-August, the waterpark remains open till 9pm for evening fun, with live music and a Caribbean theming. At Florida Aquarium, visitors get the chance to be up and close with 20,000 aquatic creatures from frogs to sharks in natural habitats that help bring the outdoors inside. Follow the Florida Wetlands Trail to meet alligators and frolicking otters, or head the Beaches section to admire pet-able stingrays, sea turtles and a 300lbs. grouper you won’t find on a local menu. Visitors can join an interactive Swim with the Fishes program or a Dive with the Sharks activity for an extra fee. Outside, there are daily cruises to meet dolphins in Tampa Bay. It is one of the country’s best designed marine life habitats, with several family sleepovers annually and an active day camp program during summer. The Yankees’ other field, this it the on-again, off-again World Champions’ spot for spring training. Come here to get your autographs and get a first-hand look at what it takes to be a baseball champion: the Inside Experience Spring Training program takes your family behind the scenes for a photo and autograph opportunity with former and current Yankee players, but just watching a game in this relaxed venue is fun too. At other times of year, this field hosts popular music concerts. Are you thinking about spending some extra time in central Florida? The city of Tampa takes full advantage of every local attraction to create summer-long and drop-in day camps for local and visiting children, based on each attraction’s educational mission. Here are some examples of the top family schoolbreak programs, with contact information. Busch Gardens Adventure Camps 877/BGT-CAMP – Animal-loving kids from around the world come to sleep over at Busch Gardens Tampa where they can cook up animal treats in a Nutrition Kitchen, follow vets and trainers to get a sense of their careers, enjoy animal interactions, do art projects inspired by the park’s Africa theming, and even have fun on the thrill rides. Camps are divided into age-appropriate programs for kids in 5-12th grade, as well as college students interested in veterinary science. Kids spend more time outdoors here than at other local camps, and dorm facilities are right at the park. Weeklong day camps are available for K-12th graders, too. Museum of Science and Industry Summer Science Camp (813/987-6000) – A supervised day camp designed for K-5th graders, these summer and school break sessions encourage kids in STEM studies by allowing them to design video games, cook up concoctions, get creative with lasers, dig for fossils and use DNA to solve crimes, among much more fun. Even preschoolers from ages 2+ can take short classes at the museum on certain days, at no extra charge. Florida Aquarium (813/273-4015) – The Aquacamps are geared to ages 3-18 with a variety of programs that range from studying the aquarium’s unusual habitats, to interactions with marinelife in the touch tanks, to learning time with vets and trainers to better understand the marinelife. With carefully selected age-appropriate programs, your kids can study reptiles, count shark’s teeth and get to know the lemurs of Madagascar. For more information about the Tampa area and a list of local accommodations, contact the Tampa Bay Convention and Visitors Bureau at 800/44-TAMPA.